to do what you TELL it to do. I believe I can convince most people that computers aren’t anything to be afraid of, nor are they complicated to operate for everyday computer activities. Using e-mail, sharing photos, video calling with your family and other common uses of a computer are within everyone’s grasp. I would love to show your group how to enjoy a computer. He is actively seeking dates to make a presentation to your group or club. 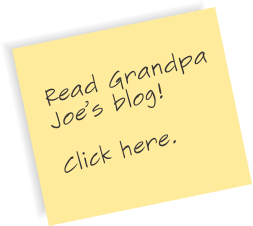 Get Grandpa Joe for an entertaining and educational meeting. Many dates are open.